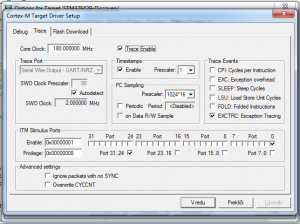 All Cortex-M4 devices have feature to output different data for debugging. This can be used instead of one USART available in STM32F4 to display data to user when something is going wrong and you want use debug. STM32F4 has SWD (Serial Wire Debug) option for programming/debugging. All STM32 boards, which have ST-Link on board, uses this option. For programming, only clock and data lines are required. Full SWD also enables you to output something from MCU which debugging. This is called SWV (Serial Wire Viewer) using SWO (Serial Wire Output) output. ST-Link on STM32 boards has this input, if SWO from MCU is connected to ST-Link by default, check schematics. Some boards (like F429-Discovery) needs solder bridge if you want to enable connection. If you are using external programmer/debugger (Keil ULINK2, Keil ULINK Pro, Segger J-Link, etc), then you should check if they have SWO option, but every serious debugger should have this! This feature is enabled only when MCU is in debug mode. In production (non debug) mode, SWV will not work. To get this to work, you have to make sure for some things. 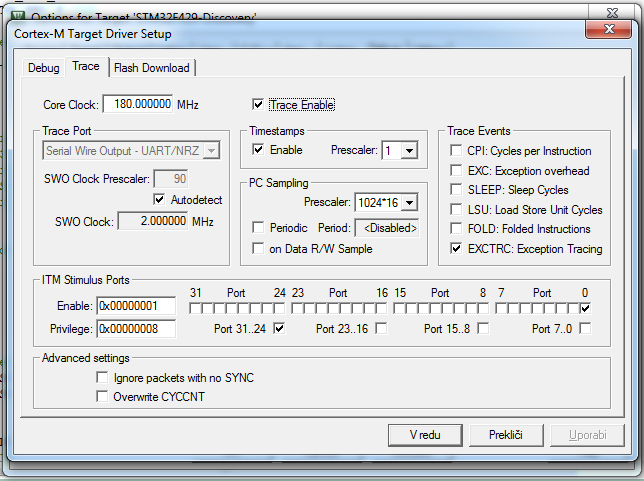 First is that you need to specify real CPU clock so trace will be synchronous (like baudrate in USART). If you don’t have Keil uVision, you can still use SWO feature. In ST-Link Utility, open “ST-LINK” -> “Printf via SWO Viewer”, set your frequency and hit “Start”. MCU will be reset, in debug mode and SWO will work if it is enabled. This can be also used if your IDE does not feature debugging mode! On initialize, SWO peripheral is enabled on pin PB3. When you are in debug mode and want to display some data, you can do with print function in my library. But then, you want to completely disable this debugging mode. One option will be to everywhere in your project delete lines when you display something to SWO. Second option, is to set one define I’ve made in library. If you enable this define and set debug to 0, then all functions becomes defines with empty content and compiler will just throw them out. They will be in your code, but will not affect to size/speed of your code. You can also leave debug active, it still won’t work if you are not in debug mode, but functions will be there, compiled and will take some time when it will try to print something. If you don’t need debug mode (project done and in production) then you should use define above, or delete all function calls for SWO you have in your project. * If debugging mode is enabled, then this is a function. Every 500ms, new time is displayed to SWO output in your debug console.